I thoroughly enjoyed and was challenged by Zollie Smith's message at District Council Wednesday Night. He challenged the crowd with the thought that God doesn't want anyone to perish, but all to come to repentance. Zollie Smith is the Executive Director for U.S. Missions for the Assemblies of God. 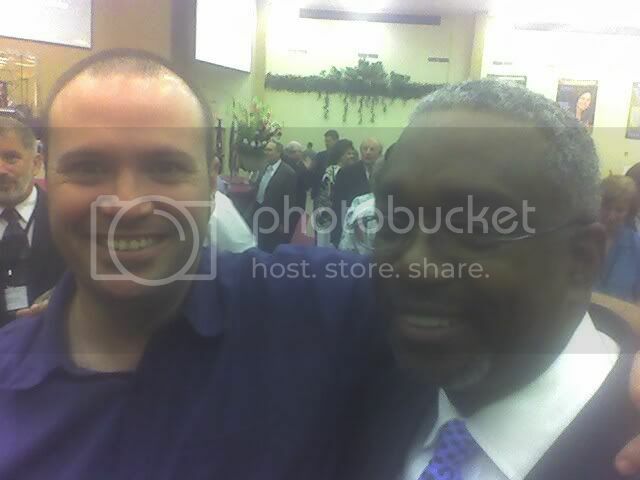 Here is a picture of the two of us taken following the Wednesday Night Service. It was taken on my mobile phone. That is why the picture is so hazy.